Several years ago, I had the pleasure of judging at the All Waterfowl Show now held in Connersville, Indiana. During that show, I saw Steinbacher geese for the first time and was most impressed with their appearance as well as their behavior. They were not timid but not aggressive either and seemed to enjoy the show experience and welcomed the attention that they received. 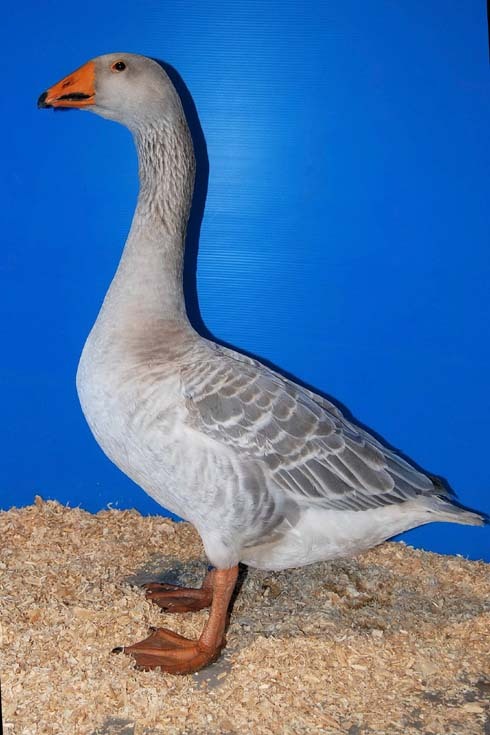 Descended from a race of geese that were used in Eastern Germany for fighting, today’s Steinbacher is well suited to be an exhibition bird which also possesses good economic qualities. The Steinbachers I observed were not a “created” breed produced through crosses of existing American breeds, they were imported pure stock. As a result, the birds at the show were remarkably uniform in type as well as in color. A Blue Steinbacher gander. Note the long length of neck and the black markings on the bill. Those unique markings are often called 'lipstick" by Steinbacher breeders. First of all, the breed is truly distinctive both in body type and in markings on the bill which I can only describe as “black lipstick” on the serrated portion of its bill which is otherwise colored orange. The black color also covers the tip of the bill. While it is bred in a few colors in Europe including blue, gray, buff, and cream, to my knowledge, only the blue is present in any quantity in the U.S. The overall type is neat and clean with no sign of keel or dewlap and the birds possess a relatively upright carriage. The bird is medium in overall size (the British Waterfowl Standard classifies the Steinbacher as a light goose while the Germans classify it as medium) and is typically very active and alert. There is some controversy over the most desirable paunch for the Steinbacher. It is generally agreed that in young birds, that there be little sign of a paunch. In older birds or females after they have layed, the German Standard specifies a single lobed paunch while the British Standard calls for a double lobed paunch. Since the breed originated in eastern Germany, I would think that a single lobed paunch in older birds would reflect what the original foundation stock possessed. In terms of weight ranges, the German Standard calls for old birds to be in the 15-17 lb. range while the British Standard specifies weights from 13-16 lbs. The Steinbacher is the only fighting breed of goose that did not originate in the former Soviet Union. The Steinbacher possesses several characteristics which give it a unique type. Its head and bill are relatively short and have a powerful appearance. The neck is long and graceful. Combine that with the markings on the bill, and one has a goose that cannot be mistaken for any other. I was so taken with the breed that I asked Bernd and Mari Krebs, who showed them, to send me more information and some pictures. They have done so and much of what they tell me is surprising. First, there is the breed temperament which one might assume to be somewhat of a problem given its background, especially during the breeding season. Apparently, the birds only are aggressive with one another as males establish their hierarchy in the flock. Even then, no serious damage is done. Another fact I found interesting is that the birds are extremely sensitive to being fed a diet which is plentiful and rich. The only deaths recorded by the Krebs family in their flock were related to a fattening of the liver which resulted from too rich a diet. The breed is used to grazing for much of its living and overfeeding can be detrimental to the bird’s health. The blue and gray colors breed true and early crosses between gray ganders and blue females yielded offspring which were all blue. The breed is strongly monogamous and attempts to breed in trios have failed thus far. The breed is apparently long lived when managed well. Reports from Germany claim birds which lived into their mid-twenties. The birds lay well and both sexes take a hand in caring for the young. I have no doubt that the Steinbacher breed will achieve popular status in the U.S. and Canada once there are enough birds to go around. Once that occurs, I would expect that the breed will easily find its way into the APA Standard and become a common attraction at the shows. Two events affecting the Steinbacher occurred at the huge Crossroads of America Show which was held in Indianapolis, Indiana in late October of 2011. The first was that the official Qualifying Meet for the Blue Steinbacher was held at that show. A Qualifying Meet is required before a new breed or variety of an existing breed can be admitted to the APA Standard. The meet was successful and will lead to the Steinbacher Fighting Goose becoming a Standardized breed of goose. The second event was the hosting of a seminar for judges and interested potential breeders that introduced them to the care and mangement of the breed. Each participant was also given a 22 page booklet developed by the Krebs family which contained many mangement tips as well as the written Standard description for the Steinbacher. I predict that within a few years, one will begin to see this unique and exciting new breed on Champion Row at major shows.